“Inflation investing” or income property investing, as Jason Hartman refers to it, can be a tricky concept to understand. 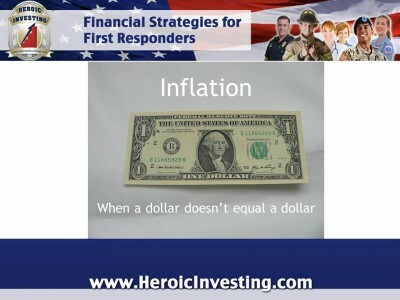 To the first responder seeking to create financial independence and accustomed to thinking of the idea that debt is bad, it’s critical to shift into a “real” vs “nominal” frame of mind in order to understand how rising inflation turns debt (your mortgage) into a financial instrument of rising value. Let’s examine a quick three-step process that might be illustrative for anyone struggling with the concept. Sometimes it’s easier to begin thinking about a new idea on a smaller scale. Rather than pondering how inflation reduces the value of a country’s currency, a potential income property investor might instead seek to grasp the idea that it is the prime mover behind the reality of one single dollar losing its purchasing power over time. Now that you’re thinking smaller, let’s introduce a real world example of how rising prices create a less valuable dollar. For an example, let’s say it is January 1, 2013, and we have looked into the future to find out that the annual rate of inflation for the coming year will be 10 percent. Don’t worry about how we found out that information. Extrasensory perception. Time machine. Make something up. The important thing here to hone in on the inflation rate. Under the given conditions, that dollar in your pocket on 1/1/2012 will only be worth .90 cents on 1/1/2013. Why? It’s simple math. When prices inflate by a given rate – in this case 10 percent – the real purchasing power of your dollar bill drops by the same percentage.